​If you are there stop by and see us. 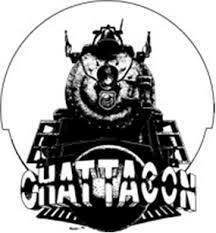 ​Chattacon is an annual science fiction convention held in Chattanooga, Tennessee. The convention is organized by the nonprofit Chattanooga Speculative Fiction Fans, Inc. First held in 1976, the convention drew more than 1,200 attendees to the Chattanooga Choo Choo Hotel in 2014. AnachroCon is a celebration of history both real and imagined. It is a place where those who have a love for yesterday’s future mix and mingle with those who chronicle the past and present. FarleyCon is dedicated to the memory of Jared Allen. Jared passed away suddenly from a short illness on February 10, 2016 and is survived by his wife, Teresa; three sons, Bishop, Deacon, Jaxon. Jared Allen was a staple on the comic and toy convention scene across the south east. He had a dream about doing a toy/wrestling show and to honor Jared’s dream and keep his memory alive, FarleyCon is an annual Toy/Comic and Wrestling show dedicated to Jared Allen. ​WHOlanta is an annual Doctor Who and British media and culture convention in Atlanta, GA. Formerly known as TimeGate, WHOlanta is the rebranded name of the convention that fans in the Atlanta area have loved for over ten years. Over 8,000 sq ft of warehouse space. We're ready for you this year MomoCon! Free parking, free entry as always! More details will be released soon. Registration for vendors open February 1st. LibertyCon is a convention that prides itself on great guests, phenomenal panels, a killer ConSuite and a 'Family Friendly Atmosphere'. They are a convention that is small on purpose (cap at 750) since they want to give the fans a chance to sit down and chat with the guests. OutsideCon is held yearly at Montgomery Bell State Park at 1020 Jackson Hill Road, Burns, TN. Not only do you get a great convention you get to camp out, hike, swim, fish and boat, if you have one, all for the price of the con. As always, OutsideCon provides plenty of food, merriment and mayhem. It does not, nor has ever, provided alcoholic beverages. However patrons, fans and family are welcome to BYOB and may imbibe on the premises. Just pick up after yourselves. Tennessee law prohibits the possession and/or consumption of alcohol by persons under 21 years of age.